When research intern Hope Steele joined mentor Rana Herro, Ph.D., for nine weeks to gain some hands-on-experience in a lab, the two went on a tear. Some 2,000 slides later, the female powerhouse had upended conventional wisdom and formed a friendship for life. Hope: What did you enjoy the most about your internship? The best part was working on so many different projects at once. Rana didn’t hold back. She let me work on everything that she was working on, which was both scary and rewarding. I learned so many new techniques, some of which proved to be quite challenging, but in the end I’m thankful that Rana pushed me so hard. Rana: What did you enjoy most while working with Hope? She really stood out. Simply put, she was productive and fun. Despite her complete lack of lab expertise, she rose to the challenge and delivered more data in shorter time than many others despite having zero hands-on-expertise before she came. 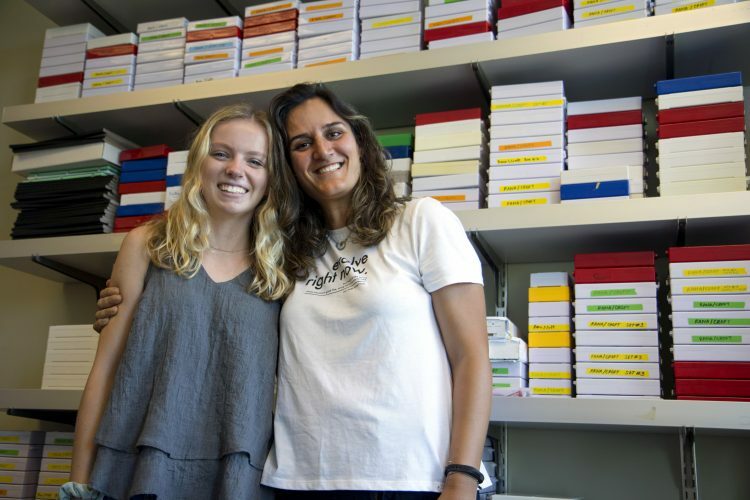 Intern Hope Steele and her mentor Rana Herro in front of a wall stacked high with thousands of slides that Hope helped process and analyze during her summer internship. Hope: What did you work on during your internship? Rana had me working on all of her projects about inflammatory/fibrotic diseases, which meant lots of learning and new discoveries. 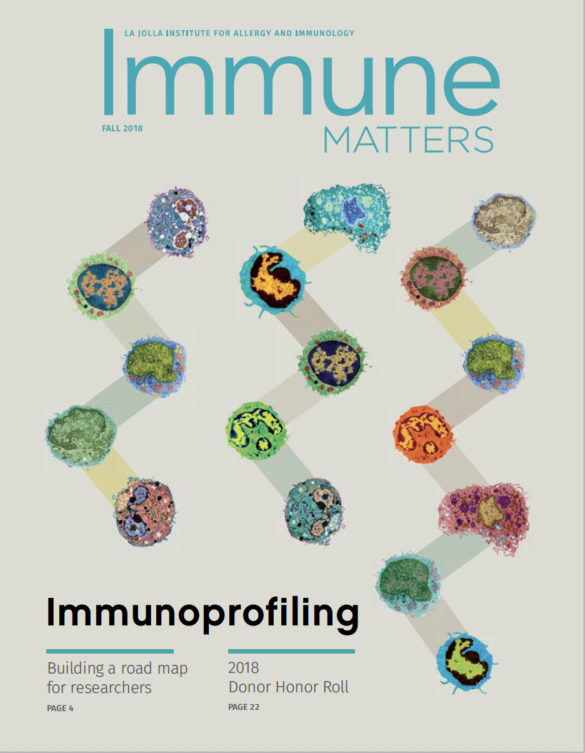 One of the most interesting projects to watch come to fruition was her atopic march project, where allergic disease moves from skin–lung–gut. She had started the work on this before I arrived for the summer, but I came just in time to stain the many, many sets of slides for analysis. Some weeks we were staining up to 200 slides, but once the slides were stained we could finally start analyzing them, which became one of my favorite parts of the summer. We found that if you compare a patient with asthma to a patient who has asthma that stemmed from atopic march, you will see very different pathologies. Knowing this, it can help solve the issue of why some patients, who seemingly have the same disease, respond differently to the same medications. Rana: What was your goal for Hope when she arrived in the lab? I wanted to involve her in as many projects as possible. We worked side by side on asthma models, IPF (idiopathic pulmonary fibrosis) and scleroderma models, NASH (non-alcoholic steatohepatitis) models and psoriasis models. She was able to learn several advanced techniques ranging from fluorescence microscopy and analysis to flow cytometry, RNA extraction and real time PCR models. She learned it all. Hope: What was it like working with Rana? Rana is a powerhouse. She is absolutely dedicated to her work, but not just for her own personal gain. She genuinely does this work in order to help people live healthier, better lives. It was very inspiring for to observe this drive and watch her apply it to every one of her projects. Having such a strong female mentor in the STEM field made this experience all the better for me. She pushed me to try new things, even when I was unsure of myself, and she became my biggest supporter in the process. As I worked with her side-by-side this summer, Rana became a lifelong friend and role model for me. Rana: Did spending time at the bench change the way Hope feels about science? When Hope first showed up, she had no clue on whether to pursue a scientific career or not. I was ecstatic to hear her saying the day she left that she wants to transfer the whole internship and project to Washington University where she is studying. The science seed was successfully planted and I can see how motivated she is to contribute. Hope: Did the internship influence your career plans? Coming into the internship, I wasn’t sure if I wanted to pursue a career in the research or medical field. I still haven’t decided for sure, but this internship showed me a way that I could be involved in both. Yes, this was a research internship, but also we were making medically important discoveries that could potentially lead to drugs to help people. Prior to my time at the institute, I hadn’t really thought about the overlap of the two fields. Rana: Will Hope return to the lab? I am very proud of Hope. I consider her my kid in science and care deeply for her and her future. The door will always be open for her to come back and work together. A beautiful person inside out with great talent that will impact others greatly with her determination and sense of responsibility. I believe she will succeed brilliantly. 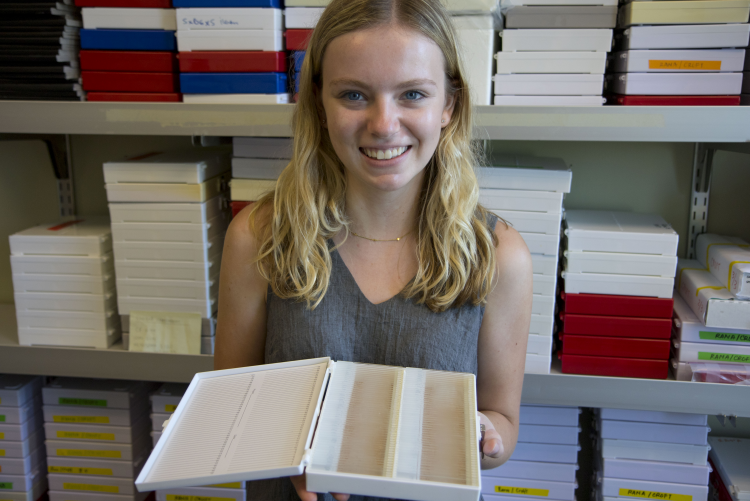 Hope with one of the storage boxes that hold 100 slides each.